There were two groups touring the house while I was there this morning. I overheard two people say they wanted to come back for an Art Tour. That’s exactly how I felt after my first tour through the house – it was like a starter and I wanted to work my way through the entire menu! Check out Olveston’s website as there are a variety of tours on offer. Three paintings in the Olveston Collection played with me during my time in the house. The Yellow Sunbonnet by Grace Joel was one I wanted to capture. But the young lass in the painting was having none of that fancy poetry stuff written about her. I approached the poem from several angles and nothing worked. It got to the point that whenever I walked through the Library I could feel her eyes following me, willing me to keep going and leave her alone! So I have, for now. I’ll try again when I’m based at home and she’s too far away to taunt me. The Gardener’s Head (Albert C Tayler) was a very obliging painting, behaved well and quite happily put up with my close inspection and murmurings. Head of an Old Woman (Frances Hodgkins) was another stubborn painting. The old woman clammed up on me, wasn’t giving me any clues or allowing my imagination to wander. She’s hiding some story and I’m determined to write about her, one day. Sunny Corner in Volendam is my favourite painting in the house. Thomas A Browne was well liked by the Theomins – they have a number of his works in the Billiard Room. Sunny Corner could almost go unnoticed as it’s the last painting in the Drawing Room before you exit. The Drawing Room is a real head turner, everywhere you look there’s something to catch your eye. And if you’re a pianist you might even be invited to have a play on the Steinway. The Turkey Vendor, Seville (S Clements) is the final painting that thwarted me. I’ve got an idea this one will be the easiest to retrieve and rework. Just a little coaxing and that poem will appear. Well that’s what I’m telling myself in a very positive way. And so, my days at Olveston are numbered. August 17th is the last day of the PoARTry @ Olveston exhibition and my residency. I thought having a Questions and Artists session would be an appropriate way for me to end my stay. 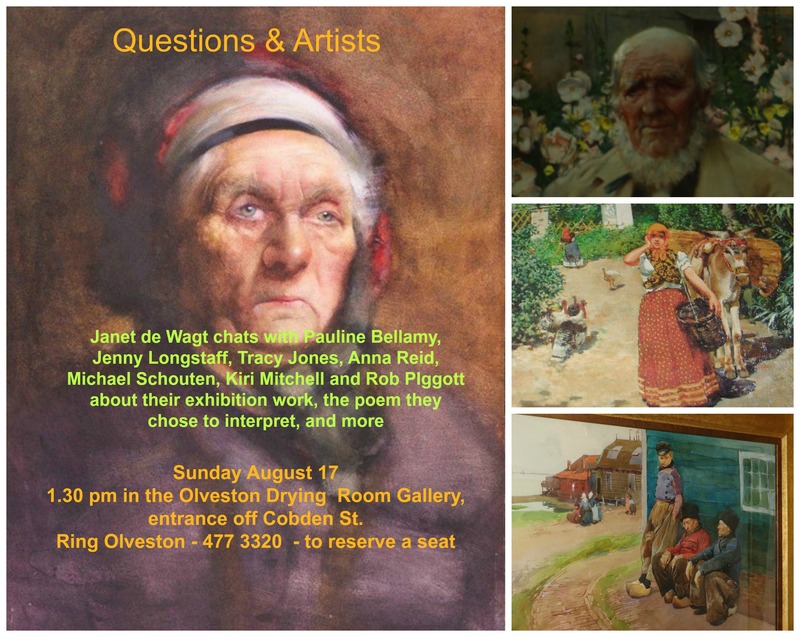 Come along and hear Janet de Wagt tempt and tease some of the local exhibition artists to reveal all! If you’re interested please ring Olveston -477 3320 – and reserve a seat as space is limited. This entry was posted in Art, Poetry and tagged Albert Tayler, Frances Hodgkins, Grace Joel, Head of an Old Woman, S Clements, Sunny Corner Volendam, The Gardener's Head, The Turkey Vendor Seville, The Yellow Sunbonnet, Thomas A Browne. Bookmark the permalink.